Showcase your original handmade goods! Examples of acceptable artist/artisan submissions include: pottery, painting, original photography, and handmade art mediums. Examples of acceptable other marketplace submissions include: olive oil, honey, handmade soap, spice blends, etc. (must have proper health department permitting). All work must be original—conceived, designed, and executed by the exhibiting artist/artisan (A gallery representative is allowed to run the booth on behalf of artist/artisan). Commercially mass-produced goods or third party goods will not be accepted. Fill out the application form completely along with the payment and the signature portion of the application. Entries that do not meet the above requirements will not be considered. Once a participant has been accepted as a Sample the Sierra vendor, payment is non-refundable. Payment is only refundable in the event that the festival has to be cancelled by the event producers. I understand that there are a limited number of booth spaces available. I have read the attached informational sheet and understand the requirements of participation. I agree to comply with all of the City of South Lake Tahoe and El Dorado County rules and regulations. I agree to all provisions of entry to this exhibition. Vendors are responsible for all equipment for product display, i.e. tables, hanging apparatus, sculpture stands, etc., and for making sure their product is displayed securely and safely. 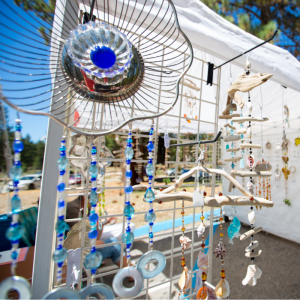 Tahoe Chamber will not be held liable for any damage incurred to any equipment brought into the festival by participating vendors for any reason. I give the right to the Lake Tahoe South Shore Chamber of Commerce to reproduce, use, and edit the images that I am submitting with this application for advertising purposes, and hereby certify that I am the owner of such images and have the right to grant their use. Fill out the attached application form completely, and submit payment for a minimum of $75 to participate. Include at least two images of your work and one image of your booth (if an image of booth not available, please provide description/ materials and diagram). Printed photos or digital images on a CD are acceptable. Do not send original artwork. Copy of CA Sellers Permit or Temporary Seller’s Permit registered to an address in South Lake Tahoe. If you do not have one please visit www.boe.ca.gov to obtain one. There is no charge. Include a self-addressed, stamped envelope, large enough to accommodate the return of your materials. 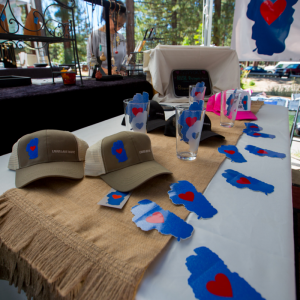 Participants will be selected by the event committee and booth assignments are at the discretion of the Tahoe Chamber. A limited number of booths are available and Galleries representing multiple artists but are encouraged to apply. Preference will be given to exhibitors who are representative of the Sierra Nevada region. A limited number of individual 10×10 spaces for artists are available and are assigned on first-come, first-serve basis. There is an option for a 10×10 tent to be provided to you by the festival at an additional charge. Tents must be requested and paid for in advance. Power will be supplied to your booth only if requested and paid for in advance. There is a $75 fee to participate. Payment and photos of your products must be submitted with the application. This is a juried art show, preference will be given to artists who represent the region. Exhibitors must provide framing, walls, tables, stands, etc. If providing your own tent, booth framing must be sturdy and prepared for variable weather conditions. Sample the Sierra will not be held liable for any damage done to equipment or products displayed at the festival. Set up time between 8am and 12pm (all set up must be complete by 12pm). Tear Down between 5pm and 8pm (tear down is not allowed to start until 5pm and MUST be completed by 8pm). Vehicle access to set up/ tear down is on a first-come, first-serve basis, and vehicles will only have access for a 30 min period. After unloading at the assigned booth, exhibitors park in provided vendor parking spaces. Due to the layout of the site, exhibitors will not be able to park near their booth. Late arriving exhibitors will be denied participation. More detailed parking information will be provided upon confirmation of participation. 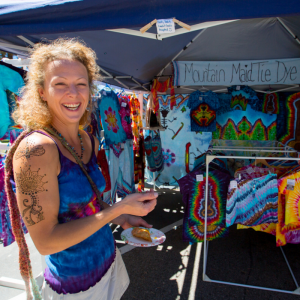 Each vendor must obtain a seller’s permit with the California Board of Equalization (there is no fee). 8% Sales Tax must be collected on the sale of goods and each seller must pay their sales tax directly to the Board of Equalization. Each vendor must report their total sales for the event to Event Organizer at the end of the event. Your participation in the event cannot be confirmed until a valid CA Sellers has been obtained. Please email Emily, Director of Operations for information on how to obtain a valid permit. Download the 2019 Artist Application and mail or email to participate. Applicants will be invoiced upon receipt of application.